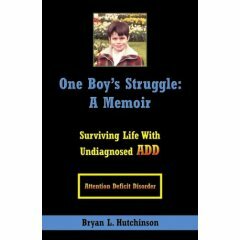 Bryan Hutchinson, author of "One Boy’s Struggle: A Memoir - Surviving Life with Undiagnosed ADD" sent me his book to read a while ago and I finally got a chance to read it. Wow. It was not easy for me to read this because any story of child abuse is painful for me to hear, but I'm glad I did. His book gives a very heartfelt account of what it was like growing up with quite severe undiagnosed ADD that resulted in his being the victim of some very violent attacks by own father and other people as well. It's not easy to help people understand who don't have ADD understand what it is really like, but stories like Bryan's really help. Whenever I hear someone talk about how frustrating it is to work with or live with someone who has ADD, I wish I could tell them how painful and frustrating it can be to actually have it! Those of us with ADD often feel so much worse about ourselves than you can imagine. We don't want to disappoint people, but it happens, in fact we really tend to dissappoint ourselves most of all. Can you imagine what it would be like to get up one day and being able to walk just like everyone else, but then the next day you wake up and you can't. People might think you are lying or doing it on purpose because they saw you walking yesterday and then saw you walking again the next day. THAT IS WHAT IT IS LIKE to have ADD. It's like you can't control when your brain is going to work with or against you. It feels like sometimes your brain freezes or gets paralyzed and you can't control it. It's like when you have too many windows open on your computer and it suddenly just CRASHES without warning. If you can relate to having any kind of inconsistent problem, like back pain, or shoulder pain, or even having your computer crash on you, then you can better understand what it is like to have ADD. The agony of being able to function well sometimes, but not others truly destroys your sense of self-worth and self-confidence. Bryan's story is an incredibly touching and poignant account of what it's like to have ADD. What many people don't realize is how painful it is to the individual who WANTS so desperately to be able to be consistent and to meet the expectations of others AND of themselves but literally CAN'T. In his book, Bryan shares the struggles he experienced as a child and even now as an adult living life with undiagnosed ADD. His story is one that I and many others with ADD can relate to even if our symptoms weren't as severe and we weren't beaten up physically for them. Once he was finally diagnosed and got treatment for ADD, his life dramatically changed and improved. He became more able to accept who we was and design a life that worked for who he was instead of twisting himself into knots to fit into what he thought he "should" be. Bryan’s story highlights the importance of understanding and treating ADD/ADHD as early in life as possible. If you are feeling like you are the only one, hearing others stories is a great way to realize that you aren't and begin the process of accepting who you are and working with what you have. It also helps you become more compassionate with yourself. Bryan's Book "One Boy’s Struggle: A Memoir - Surviving Life with Undiagnosed ADD"
How I Survived My Life with Undiagnosed Adult ADD and Learned to THRIVE! ADD may or may not exist. It may even just be a different personality type. Who knows. But, what I DO know is that it is NOT comparable to waking up one day being paralyzed and unable to walk. Oh no, not at all. I am a brain tumor patient and know exactly what it's like to wake up partially paralyzed one day and unable to walk. The last thing I cared about was impressing people that I couldn't walk and making sure they believed me! Oh, it's definitely not the same thing at all! First, thank you for reading! Second, Thank your sharing your concern. I truly appreciate having the opportunity to respond. Please accept my apologies for any lack of clarity in my writing that contributed to this misunderstand. I did not intend to imply that having ADD was like being paralyzed in ANY way. In contex, I was explaining that ADD is inherently INCONSISTENT - one day you can, next day you can, then you can't. I was only trying to use an analogy to explain why it is so frustrating. You never know whether you are going to be "on" or "off" and there is a 50/50 chance. For most people, they are only off maybe 80/20 or 90/10. It's the "magnitude" of the problem that causes the serious disruption to your life. Blessings and have a wonderful holiday and new year! Awwww...Bryan that so sweet of you! You are very welcome!